There is one reason why lots of massive brands are using SMS as a customer service channel, and that is because the consumer prefers this method of communication. Quick whilst still personal, efficient whilst still easy, what is not to like about SMS in this format? 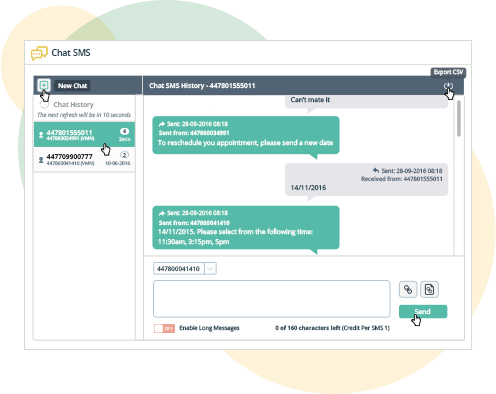 Chat SMS enables your account to have a "chat" through the portal as you would in your native phone SMS app, where you can see messages sent and received in a conversational format. Nicknames can be applied to the contact number so you know exactly who you are chatting with. With notifications when you have a new message, the ability to have several chats at once and real-time updating this is an ideal customer service or support channel. This feature can also be used in conjunction with Email to SMS so that you can use your email client to have a conversation with someone via SMS without any crazy development work or integration! ChatSMS is really easy to use. You would need a long number (VMN) enabled in your account for your recipients to reply to.